Why am I always tired? Is it because of the excessive hardships brought upon by college life? Is it the never ending stressful supply of homework assignments and tests? Does it have anything to do with working nights and weekends just to make enough money to put Ramen Noodles and frozen pizza on the table? Nope. Its because I stay up late watching funny cat videos. And other golden internet content. 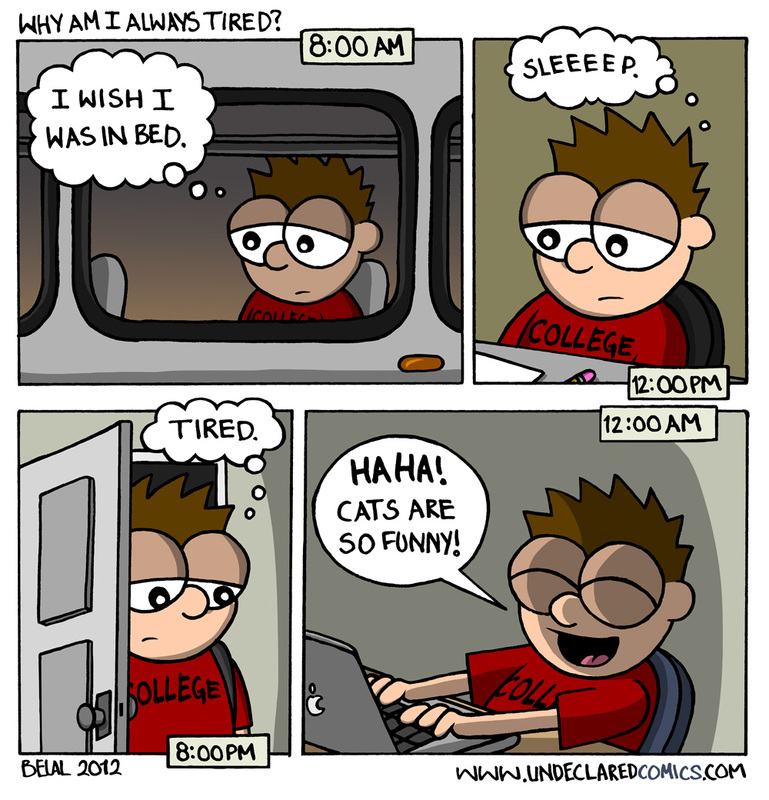 This is completely true, and it may not be cat videos, but the fact that I saw this comic at 2am kinda proves it. This is my new favorite comic. This is my new favorite comment. Now this is my new favorite comment. You are GREAT! I was just looking at google, trying to find some hint about why I am tired all the time and found your site. I am a non-traditional student (55, married, kids…..) and found your comics to hit my life dead on. LOVED the idea of being organized. He he he. My husband just doesn’t understand but you do. Someone swiped this and posted it on evil milk which is why I found your comic!! Hi it’s me, I am also visiting this web site on a regular basis, this web site is actually pleasant and the people are genuinely sharing nice thoughts.